U3A noosa is part of the U3A international movement of self-help, self- managed, lifelong learning organisations. It provides opportunities for members to share learning experiences in a wide range of areas of interest and to pursue learning not for qualifications, but for fun and self development. U3A noosa was incorporated independently in July 1991 and is a non-profit community organisation run entirely by volunteers. Initially, there were 200 members and 22 volunteer tutors. Over the ensuing years, membership has grown to roughly 700 members with up to 60 courses covering a wide variety of subjects. U3A noosa has its headquarters at Michell House in Tewantin with a well equipped art studio, library, games room, language room, computer room, an auditorium (seating 60), kitchen and a social area. Members with a lifetime of experience, expertise or know-how in professions, occupations or through hobbies, are encouraged to become tutors. Mutual interest in learning for fun leads to new friendships based on an expanded social experience. 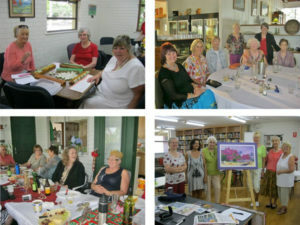 Most courses are held at U3A noosa headquarters at Michell House in Tewantin. Whilst the majority of our members are semi-retired or retired, U3A noosa actively encourages people of all ages to be part of our organisation and community. U3A noosa offers courses and events over a wide range of subjects. Click here to see the full list. In addition, we hold interesting presentations on a variety of topics at our Friday Afternoon specials, we have weekend events such as our in-house Saturday Afternoon at the Movies as well as periodic social events such as bus trips to one off events such as art galleries, museums, the theatre etc.